The McDonald's franchisee popped after a strong earnings report and improving investor confidence. 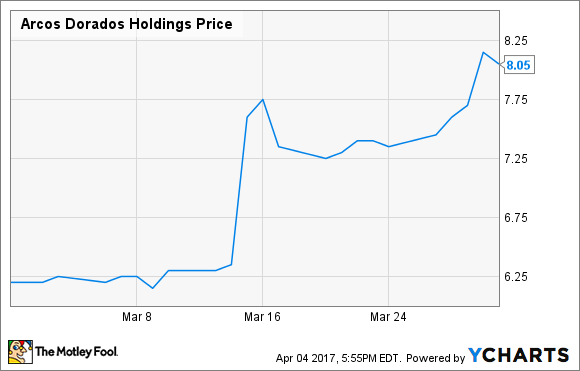 Shares of Arcos Dorados Holdings Inc (NYSE:ARCO) climbed last month after the McDonald's franchisee posted a strong earnings report and got a boost after pricing a debt offering. According to S&P Global Intelligence, the stock finished up 29.8%. McDonald's Latin American franchisee beat estimates on the bottom line in the final quarter of last year, as the business continued to return to health. Earnings per share increased from $0.03 to $0.10, ahead of expectations at $0.06, and revenue increased 5.5% to $807.2 million. That growth was up 14.2% in constant currency, or 8.8% excluding Venezuela. CEO Sergio Alonso said the company "ended the year strongly with a 240 basis-point increase in Adjusted EBITDA margin." He noted efforts to streamline cost structure and reduce debt levels to improve the company's balance sheet. Towards the end of the month, the company priced $265 million in debt at a 5.875% rate, lower than the interest rate on debt it just retired. Shares of Arcos Dorados have been on an upswing since last February as Sergio Alonso's transformation plan seems to be taking hold. The company refranchised restaurants with a goal of raising $250 million in capital to pay down debt and shore up its balance sheet. Meanwhile, the Brazilian economy may finally be turning around, which should further boost the stock. Shares still have a long way to go to get back to their IPO range around $25. That's good news for shareholders as the Arcos' financial picture continues to improve.